McCoy wasn't present for the start of the Buccaneers' offseason program Tuesday, Rick Stroud of the Tampa Bay Times reports. Analysis: This isn't surprising after coach Bruce Arians publicly acknowledged the possibility of McCoy being cut or traded prior to the season. 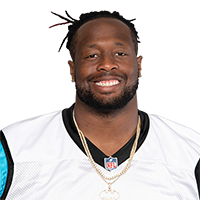 The 31-year-old is due a non-guaranteed $13 million base salary in 2019, coming off a campaign in which he had six sacks and graded out as Pro Football Focus' No. 28 overall interior defensive lineman. Coach Bruce Arians acknowledged the possibility McCoy won't stay with the Buccaneers for the 2019 season, Greg Auman of The Athletic reports. "[McCoy]'s not as disruptive as he was four years ago," Arians said Tuesday. "He's still a good player. If he's here, he's our starting three (technique)." McCoy is expected to stay in Tampa Bay for 2019, Rick Stroud of The Tampa Bay Times reports. 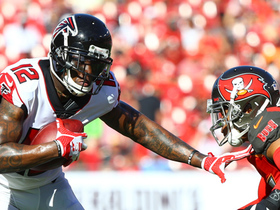 McCoy totaled four tackles (three solo) and was credited with three quarterback hits overall in the Buccaneers' 34-32 loss to the Falcons on Sunday. He finished the 2018 season with 28 tackles (17 solo), including three for loss, six sacks and one pass defensed across 14 games. McCoy (ankle/shoulder) won't carry an injury designation into Sunday's game against the Ravens, Greg Auman of The Athletic reports. Analysis: McCoy began the week as a limited practice participant but was able to practice fully Friday to avoid the questionable tag. The 30-year-old will take up his usual starting role at defensive tackle for the Buccaneers. McCoy (ankle/shoulder) was a limited participant in Wednesday's practice, Carmen Vitali of the team's official site reports. Analysis: McCoy logged a robust complement of 55 snaps in the Week 14 loss to the Saints, when he was credited with a sole assisted tackle. The multi-time Pro Bowler has seen his production wane during the stretch run, as he's notched just one tackle apiece for three straight games overall. McCoy's limited participation is almost assuredly a form of maintenance for the nine-year veteran, as there's no indication at this point that his Week 15 status is in any jeopardy. McCoy had two solo tackles and a sack in Sunday's 27-9 win over San Francisco. Analysis: McCoy missed two games with a calf injury but returned Week 9, and has added to his sack total in each of the last four games. The 30-year-old has 19 tackles (11 solo) and six sacks, making him an unreliable option for IDP purposes. McCoy recorded four tackles (all solo) and one sack during Sunday's 38-35 loss to the Giants. Analysis: McCoy took down veteran quarterback Eli Manning for his fourth sack of the season. The veteran defensive end's low tackle volume makes him difficult to trust in IDP formats, as he only has 17 tackles on the season. McCoy will look to bounce back against the 49ers in Week 12. McCoy recorded one sack across 43 defensive snaps in Sunday's loss to the Redskins. Analysis: Immediately after rookie Vita Vea reached Alex Smith for his first career sack, McCoy got to the veteran for his third QB takedown of the campaign. The run-stuffer now has 13 tackles (five solo) on the season. 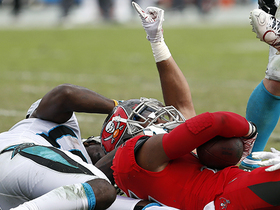 McCoy tallied two solo tackles, including a half-sack, in the Buccaneers' 42-28 loss to the Panthers on Sunday. Analysis: McCoy was returning from a two-game absence due to a calf injury. The multi-time Pro Bowler only has two sacks through six games thus far this season, putting him on pace for his lowest total since the 2012 season. However, McCoy has proven capable of multi-game, late-season sack surges in recent seasons, so he retains robust IDP value now that he's apparently back at full health. McCoy (calf) will play Sunday's game versus the Panthers, Adam Schefter of ESPN reports. Analysis: McCoy will return from a two-game hiatus to face off with a division rival. He'll record starter snaps, but the veteran defensive tackle had just eight tackles (three solo) and 1.5 sacks in the first five games, making him an unattractive IDP option. McCoy (calf) is listed as questionable for Sunday's game at Carolina, Greg Auman of The Athletic reports. Analysis: McCoy was downgraded to a non-participant Thursday but didn't face any limitations at Friday's practice. The 30-year-old has missed the last two games but appears on track for a return against the Panthers. McCoy (calf) did not practice Thursday, Greg Auman of The Athletic reports. Analysis: McCoy was able to log a limited participation in practice to begin the week, so his absence just a day later is somewhat unexpected. It seems likely that the defensive tackle's lack of practice is related to the calf injury which has caused him to miss two straight games, but it's worth noting that McCoy could have simply spent the day with his newborn child. The Buccaneers' final injury report of the week should shed some light on McCoy's chances of suiting up against the Panthers on Sunday. McCoy (calf) was a limited participant in Wednesday's practice, Carmen Vitali of the team's official site reports. McCoy (calf) is ruled out for Sunday's game against the Bengals, Jenna Laine of ESPN.com reports. Analysis: McCoy will miss his third consecutive game due to a lingering calf issue. With Vinny Curry (ankle) also ruled out, the Buccaneers will enter Week 8 missing both starters on the right side of the defensive line. Rakeem Nunez-Roches and rookie Vita Vea should benefit from increased snaps with McCoy sidelined. McCoy (calf) has been ruled out for Sunday's game against Cleveland, Greg Auman of The Athletic reports. Analysis: McCoy didn't practice at all this week and will now miss a second straight game. With starting defensive end Vinny Curry (ankle) also ruled out, the Tampa Bay defense is in even worse shape than usual, which is good news for Baker Mayfield and the rest of the Cleveland offense. McCoy (calf) was a non-participant in Wednesday's practice. Analysis: McCoy was not spotted wearing a boot on his right foot Wednesday despite him wearing one after Sunday's loss to the Falcons, Greg Auman of The Athletic reports. McCoy should be considered questionable for Sunday's game against the Browns, and if the veteran defensive tackle is unable to get healthy it could once again signify increased snaps for rookie Vita Vea. McCoy has been ruled out of Sunday's game against the Falcons with a calf injury, Greg Auman of The Athletic reports. Analysis: McCoy had 10 tackles (four solo) and 1.5 sacks entering the game. Vita Vea will take over at defensive tackle for the Bucs. McCoy (biceps) was removed from the injury report ahead of Sunday's game against the Bears. Analysis: McCoy was a full participant in Friday's practice and is ready to continue his strong start to the 2018 campaign. Through three games, the veteran defensive tackle has tallied eight tackles and 1.5 sacks. McCoy (biceps) was a limited participant in Wednesday's practice, Carmen Vitali of the team's official site reports. Analysis: McCoy apparently came up with the injury during Monday night's loss to the Steelers, and it was serious enough to affect his practice participation to a degree Wednesday. The remainder of the practice week should provide clarity on whether the issue has any chance of keeping the Pro Bowl defensive tackle from suiting up against the Bears in Week 4. McCoy recorded two tackles and half a sack across 56 defensive snaps in Monday's loss to the Steelers. 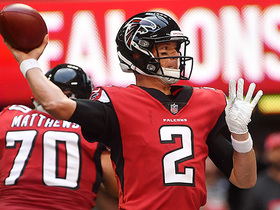 Analysis: The big stuffer has now reached the quarterback in each of the past two contests and has a season-total of eight tackles, making him a solid option in most IDP leagues. McCoy logged three tackles (two solo), including a sack, and was credited with two quarterback hits overall in the Buccaneers' 27-21 win over the Eagles on Sunday. Analysis: McCoy logged his first quarterback takedown of 2018 when he brought down Nick Foles. The 30-year-old also logged three tackles for the second straight game to open the season, and he appears ready to offer solid IDP value for yet another campaign. 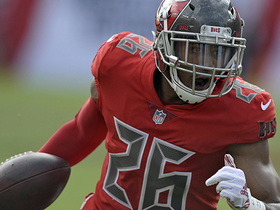 McCoy logged three tackles (one solo), including one for loss, and was credited with two quarterback hits overall during the Buccaneers' 48-40 win over the Saints in Week 1. 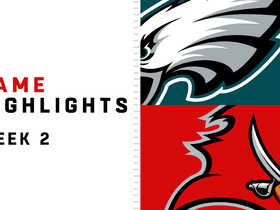 McCoy collected three tackles (two solo) in Sunday's 31-24 win over the Saints. McCoy (biceps) won't carry an injury designation into Sunday's game against the Saints, Jenna Laine of ESPN.com reports. Analysis: McCoy was a limited practice participant Wednesday and Thursday but was able to finish the week with a full practice to avoid the questionable tag. This was to be expected after McCoy indicated earlier this week that he was going to play in Sunday's season finale. McCoy (biceps) was a limited participant in Wednesday's practice. Analysis: McCoy was back in action in last Sunday's loss to the Panthers and managed four tackles (two solo) and a sack over 53 snaps. His limited participation to start Week 17 prep is likely just precautionary, as there were no reported setbacks stemming from his extended workload versus Carolina and McCoy has made his intentions of taking the field in the regular-season finale known in no uncertain terms. The final two practice reports of the week should definitively confirm McCoy's availability. McCoy (biceps) managed four tackles (two solo), including a sack, in Sunday's 22-19 loss to the Panthers. Analysis: McCoy was effective in his return from what was effectively a two-game absence, considering he'd exited the Week 14 loss to the Lions after one play. The perennial Pro Bowler managed his first sack since Week 11, while his tackle total was also his best since that contest. McCoy needs one takedown of Drew Brees in the regular-season finale versus the Saints this coming Sunday to post at least seven sacks for the fifth consecutive campaign. McCoy (biceps) is active for Sunday's game against Carolina, Scott Smith of the Buccaneers' official site reports. Analysis: McCoy sat out last week's game but was able to return to full practice by Friday, rendering his active status as no surprise. Expect him to see his usual role along the defensive line. McCoy (biceps) is listed as questionable for Sunday's contest against the Panthers, Jenna Laine of ESPN.com reports. Analysis: McCoy missed the Buccaneers' Week 15 loss to the Falcons, but he was able to log a full practice on Friday after a pair of limited sessions earlier in the week. All signs point to McCoy suiting up in Week 16 at this point, resulting in depth roles for Clinton McDonald and Sealver Siliga at defensive tackle. McCoy (biceps) was a limited participant in Wednesday's practice, Jenna Laine of ESPN.com reports. Analysis: McCoy has been dealing with the injury since exiting the Week 14 loss to the Lions after one play. While he was able to avoid the surgeon's knife, he was forced to sit out last Monday night's loss to the Falcons. McCoy remains hopeful of playing Sunday against the Panthers, with Thursday's injury report slated to shed further light on his progress, or lack thereof, toward that goal. McCoy (biceps) will not play in Monday's game against the Falcons, Greg Auman of the Tampa Bay Times reports. Analysis: McCoy injured his biceps on the first play of last week's 21-24 loss to the Lions. The Pro Bowl defensive tackle subsequently underwent an MRI, and while the results are unknown, it was determined he would avoid surgery. The team remains optimistic the 29-year-old can still return this season, but it will not be for the Week 15 contest. McCoy, who hurt his biceps early in Sunday's 24-21 loss to the Lions, remains hopeful of playing this season, Greg Auman of the Tampa Bay Times reports. Analysis: McCoy was reportedly hurt on the first play of the contest, although he logged a total of 12 snaps overall before exiting. The Pro Bowl defensive tackle was slated for an MRI earlier this week as per Jenna Laine of ESPN.com, and while the results aren't fully known, McCoy will avoid surgery, per Scott Smith of the Buccaneers' official site. Thursday's injury report -- the first of the week since Tampa doesn't play until Monday against the Falcons -- should shed further light on McCoy's status. McCoy fears he suffered a torn biceps during Sunday's 24-21 loss to the Lions, Roy Cummings of WFLA NewsChannel 8 reports. Analysis: McCoy probably has a good idea, given that he suffered the same injury in both 2010 and 2011, his first two seasons in the league. The already-struggling Tampa defense can ill afford to lose its only real pass rushing threat, but it appears that's what's going to happen. McCoy (shoulder/biceps) is out for the rest of Sunday's game against the Lions, Jenna Laine of ESPN.com reports. Analysis: McCoy has played over 50 defensive snaps in 11 of 12 games so far, proving he's one of the Bucs' most trusted run stuffers. For the time being, McCoy will likely be replaced by Sealver Siliga. McCoy suffered shoulder and biceps injuries against the Lions on Sunday and is doubtful to return, Greg Auman of the Tampa Bay Times reports. Analysis: McCoy has 40 tackles (29 solo) and five sacks through 12 games, and these two injuries could keep him out an extended time if deemed serious. For now, expect journeyman Sealver Siliga to slot in at defensive tackle. McCoy posted two solo tackles -- both for loss -- in Sunday's 26-20 overtime loss to the Packers. Analysis: The Pro Bowl tackle now has nine stops behind the line of scrimmage on the season, although his overall tackle numbers are down the last two games. McCoy has just four stops over that span after amassing a combined 15 in the prior trio of contests. The 29-year-old does now have the second-highest tackle total of his career (39), but he's yet to force a turnover through 12 games. McCoy (shoulder) was a full participant in Thursday's practice, D. Orlando Ledbetter of The Atlanta Journal-Constitution reports. Analysis: McCoy was limited in Wednesday's practice with a lingering shoulder injury, but it appears as though it was a precautionary measure. Following his full session Thursday, look for McCoy to be a full go Sunday in Atlanta. McCoy (shoulder) was limited in Wednesday's practice, Greg Auman of the Tampa Bay Times reports. Analysis: McCoy has been dealing with a lingering shoulder injury all month, but it's yet to prevent him from playing in a game. Thus, his limitations Wednesday were likely maintenance-related. McCoy racked up seven tackles (three solo) -- including one sack -- and three quarterback hits overall in Sunday's 30-20 win over the Dolphins. Analysis: The 29-year-old has been battling a nagging shoulder injury, but the ailment didn't seem to affect him in the least in Sunday's dominating effort. McCoy's tackle tally was a season best, and he now has three sacks in his last two games. The Pro Bowler is perpetually a higher-end IDP option among defensive linemen, a designation that should endure through the balance of the campaign. McCoy (shoulder) doesn't carry an injury designation ahead of Sunday's game against the Dolphins, Adam H. Beasley of the Miami Herald reports. Analysis: McCoy was able to put in a full practice Friday, resulting in him avoiding the questionable tag for the Week 11 matchup. The five-time Pro Bowler had his most disruptive game of the season in last Sunday's victory over the Jets, logging two sacks as part of a four-tackle effort. McCoy (shoulder) was a limited participant in Wednesday's practice, Jenna Laine of ESPN.com reports. Analysis: The Pro Bowl defensive tackle worked through his shoulder injury in Week 10 to recorded three tackles, two sacks and three quarterback hits against the Jets. The Buccaneers are likely just being cautious with McCoy, who turned in two limited sessions last week before working back up to a full practice by Friday. The same pattern could well hold true ahead of Sunday's Week 11 tilt against the Dolphins, with the final two practice reports of the week sure to shed further light on McCoy's status. McCoy (shoulder) tallied three tackles, one sack and three quarterback hits overall in Sunday's 15-10 win over the Jets. Analysis: The Buccaneers pounded Jets quarterback Josh McCown in the Week 10 win, and McCoy played a pivotal role in creating pressure on the 38-year-old signal caller. The Pro Bowl tackle logged his first sack since Week 6 and remains behind the pace that allowed him to compile seven in 2016. However, given his pedigree, McCoy is certainly capable of racking up quarterback takedowns in short stretches, so he's always in play as a viable IDP option. McCoy (shoulder) is active for Sunday's Week 10 tilt against the Jets, Scott Smith of the team's official site reports. Analysis: McCoy never appeared to be in real danger of missing Sunday's contest, as he'd worked back up to a full practice by Friday. His presence will be especially valued with the Buccaneers already short-handed on the defensive line, as William Gholston is inactive with the neck injury that caused him to get carted off the field against the Saints in Week 9. The Buccaneers have listed McCoy (shoulder) as questionable for their Week 10 game against the Jets. Analysis: McCoy was limited in practice Wednesday and Thursday before logging a full workload Friday. Thus, he appears to be heading in the right direction for Sunday's contest. Should he ultimately be unable to go, look for Sealver Siliga to to see increased snaps at defensive tackle. Expect confirmation on his status closer to kickoff. 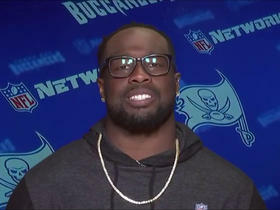 Tampa Bay Buccaneers defensive tackle Gerald McCoy joins "TNF First Look" to discuss his Walter Payton NFL Man of the Year nomination, his charity work, motivations and more. 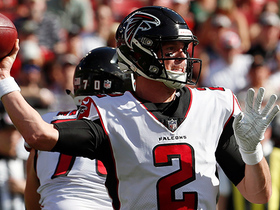 Atlanta Falcons quarterback Matt Ryan stays composed in the pocket and drops a perfect pass to wide receiver Julio Jones. 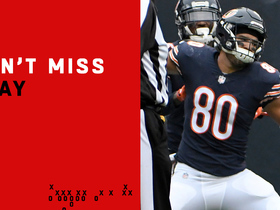 Chicago Bears quarterback Mitchell Trubisky launches a deep ball to tight end Trey Burton for a 39-yard touchdown. 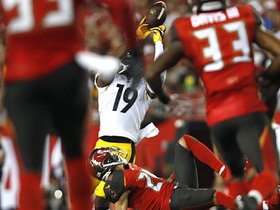 Pittsburgh Steelers wide receiver JuJu Smith-Schuster burns Tampa Bay Buccaneers safety Jordan Whitehead for a 43-yard gain. 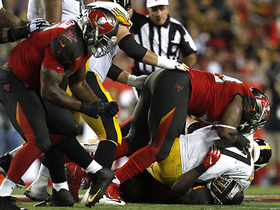 Tampa Bay Buccaneers defensive tackle Gerald McCoy and defensive end Vinny Curry converge on Pittsburgh Steelers quarterback Ben Roethlisberger for a sandwich sack.